UPDATE: “[T]he screening of Haze tonight is on despite the Darien schools’ snow day. The roads are clear and the library is open!” Emily Larkin, the Thriving Youth Program director for the Community Fund of Darien announced Monday morning. 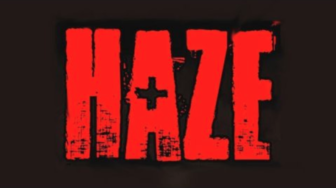 Haze, a documentary about a college freshman who died from alcohol poisoning during a fraternity initiation in 2004, will be shown at Darien Library on Monday, March 4, followed by a panel discussion with experts. You’re invited to the event, which takes place from 7 to 8:30 p.m. in the Darien Library Community Room. The panel discussion includes Police Officer Bryan Wallman, the Darien High School student resource officer; Phyllis Weihs, a licensed professional counselor; Mackenzie Coughlin, Darien High School graduate and current senior at Providence College; and a special guest who will share his journey to substance abuse recovery. “As the Community Fund of Darien’s Thriving Youth Task Force continues its powerful campaign about the concerns of underage drinking (especially binge drinking), there is simply no excuse to not see this film,” said Darien Youth Director Alicia Sillars. In September 2004, fraternity pledge Gordie Bailey died from alcohol poisoning after passing out on a couch in his fraternity house following a hazing initiation at the University of Colorado. 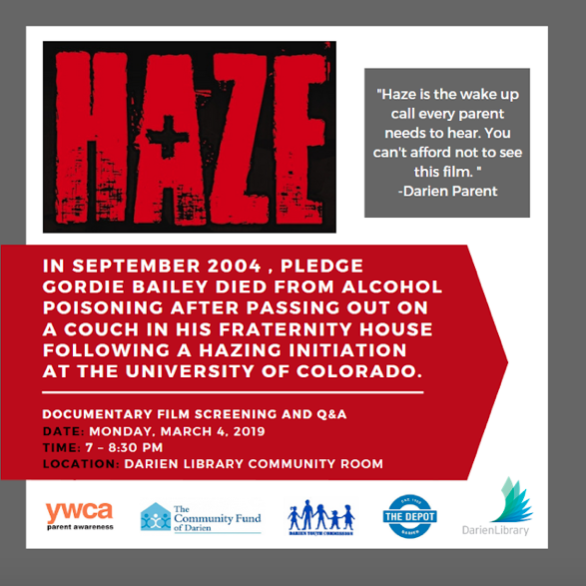 In 2008, The Gordie Foundation produced Haze, a documentary telling his story and discussing the issues surrounding college drinking and hazing. This program is for parents and mature high-school aged students. The Youth Asset Team , The Community Fund of Darien, the Darien Youth Commission, YWCA Parent Awareness, Darien Depot and Darien Library are co-sponsoring this event. For more information, call Emily Larkin at The Community Fund of Darien at (203) 655-8775 or email her at emily.larkin@communityfundofdarien.org. This article originally was published Feb. 25. The time stamp has been changed to put the link high up on the home page. 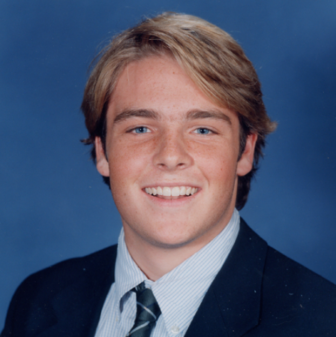 Binge drinking killed a college freshman from Greenwich in 2004, and it's killed a Darien teenager as well. "Haze," a documentary about binge drinking and Gordie Bailey's death, will be shown from 7 to 8:30 p.m., Monday, March 5 at Darien Library.